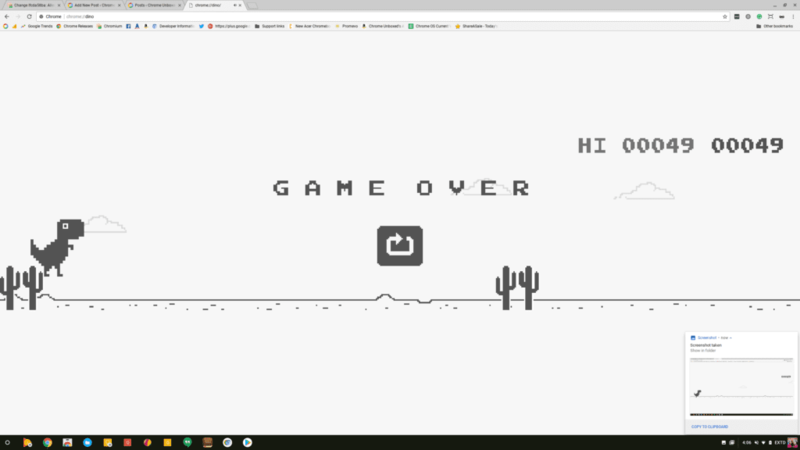 The dinosaur easter egg in Chrome is about to get a little more user-friendly. If you’re unfamiliar with the Dino game, do yourself a favor and head to chrome://dino. You can thank me later. Currently, you can play the Dino game on a mobile device and as you’d expect you can just tap the touchscreen. However, on a desktop, you have to use the space bar which is fine if you are in traditional laptop mode. With all the convertible and soon tablet devices coming to Chrome OS making use of the touchscreen would be a handy addition to Chrome’s little dinosaur. For Chrome OS and Windows users, that addition is in the pipeline. Windows devices can play the game via touch or keyboard. I know, this isn’t exactly the news of the century but it’s really cool to see these thoughtful little tweaks to the Chrome browser. I can imagine I will get more use out of this feature than I should and that’s okay. Dino game is fun and you know it.